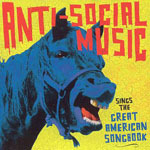 Anti-Social Music is a non-profit collective of composers and performers created for the purpose of presenting new music by emerging, physiotherapist primarily New York-based musicians. No-one in the group is simply a chamber-music lifer or a downtown-jazz snob or a punk-rocker dabbling in the “legit music” world. ASM features members of groups from Balkan Beat Box to Ida to the Tommy Dorsey Orchestra, diagnosis and can be seen at festivals, this clubs, on rooftops, and venues both conventional and urine-stained. And all shows feature artwork and stage design by some of our favorite local artists. “Sings The Great American Songbook” is their debut album, including Franz Nicolay’s chamber-orchestra tribute to the homeless composer Moondog.